Another photo from my mystery black photo albums. This photo came out of an album with just a handful of photos, many of which were identified as Walter O. Stevens. Based on her dress I feel like this is from around the 1910s. This looks to me to be a wedding portrait. This photo was pasted on the same page as the wedding portrait. It's definitely the same studio and that's Walter with a friend. Perhaps the best man? The only difference I can see is that Walter has added a watch chain to this image. I'm not positive that this was taken the same day. I flipped back through the album and noticed that Walter had been a gent and wrote his full name and home town on the inside cover. Bingo! I did a search and it seems that Walter was born November 11, 1897 in Unity, Maine. His parents were William and Jettie (Farwell) Stevens. I found some census records for the family and it appears that Walter served in WWI. However, I can't find any record of a marriage for Walter. If there was one, my original surmise that the photo was taken in the 1910s would be wrong, as Walter was still living with his parents on the 1920 census. The other photos in the album are curious as well. None are labeled and there are a couple of photos of men who appear to be sick. ﻿Nearly all the photos appear to have been taken at the same building which you can see in the background here. And here is a photo of Walter, clearly worse for the wear. His cheeks are sunken and he looks thinner. Sadly, after a search for Walter in the Maine death records it appears that he died in 1921 from tuberculosis. According to the death records it appears that he suffered from the disease for three years. And then it all came together: the photos of sick men, the "sterile" background in the photos and the sickly looking Walter...this is an album from his stay at a sanitorium. In the early 1900s, tuberculosis was a serious health concern and one that was often times fatal. Communities across the United States built sanitoriums with the intent to segregate tuberculosis patients in an attempt to keep the disease from spreading. The state of Maine had at least three such sanitoriums. The Central Maine Sanitorium in Fairfield, Maine was only twenty miles from Walter's hometown of Unity. There is not much online for the Central Maine Sanitorium other than its suspected ghost activity. However, I was able to find a postcard on ebay that I am almost sure is the same building in all of Walter's photos. The question remains, is that a wedding photo? To read more about the treatment of tuberculosis in the state of Maine, click here. 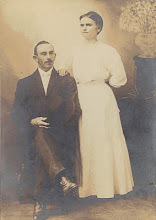 I'm not smart enough to offer much insight except to say that the first photo could still be a wedding photo because maybe he married between 1910 and 20 and maybe she died or the marriage didn't work out. That dent in her finger looks like a wedding band. (although in Theresa Wilson Rogers' wedding photos, many couples have their rings on the right hand) But my question is, how did you come to have this man's photo album? Thanks for your comment, Wendy! I agree, it does feel like a wedding photo. As to where I got the album, I bought a group of early 19th century photo albums off of ebay many months ago. I can't explain why, but I was drawn to them. I've had a blast trying to determine who they belong to and by posting some of the photos I'm hoping to reconnect them with the families they belong to. It is an amazing story.You were suppose to come upon that album and write about Walter. Thank you, Magda! I'm really hoping that someone linked to this family will one day come across it.